Prior to the demonstration December 12 the organizers had stated that it would be safe. Come safely to peaceful demonstration was one title on an article about the preparations. 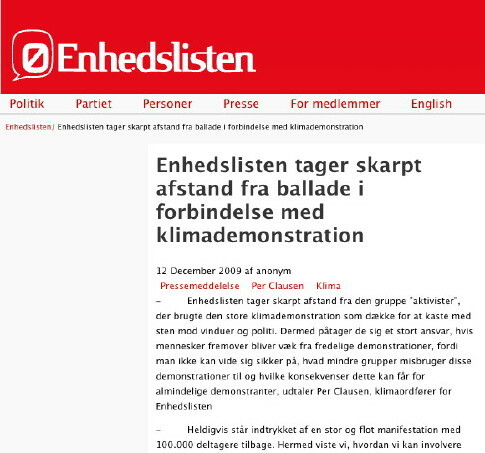 The article continued: “On 12 December is the great popular demonstration on the streets of Copenhagen – with 499 organizations from over 60 countries. Despite the many participants should there be no difficulty – the organizers have a grip on security. The people behind the demonstration on 12 December has done a great job to avoid confrontations with police. ’We believe that the demonstration is in good order. We have among other demonstration guides from the union, and we have held several meetings with police,’ says Knud Vilby, press spokesman for the demonstration on 12 December. The two most left wing parliamentary parties were the first to stand up on the side of the police version of what have happened on Saturday evening and thus legitimating the arbitrary mass arrest during the December 12 demonstration. They together with the right wing xenophobian and climate sceptical Danish People’s Party could together put their immediate efforts in favour of the police while the right wing governmental parties and the social democrats except for the Conservative minister of Justice did not need to do anything as the left wing parties did their job. It is more convincing if the organizers of the December 12 demonstration supports the police views against the demonstrators than if the right wing governmental parties which were not among the organizers would have supported the police repression of the demonstrators. ”Red Green Alliance condemn the group of “activists” who used the main climate demonstration as a cover for throwing stones at windows and police. 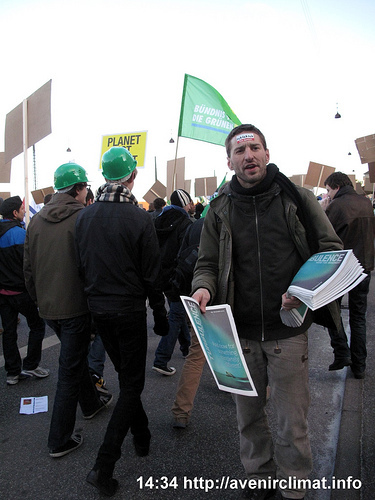 Hence they assume a heavy responsibility, if people in the future abstain from participating in peaceful demonstrations, because one cannot know for sure what smaller groups might abuse these demonstrations for and what consequences this may have for ordinary demonstrators” said Per Clausen, climate spokes person for the Red Green Alliance. The most left wing parliamentary party here sets the tone by adopting a description of the course of events which puts the main emphasis on creating a picture of one group violently attacking the police and the police that unfortunately does mistakes. The identification with the police has gone so far that even the chronology is rearranged to fit into the picture of inherently violent troublemakers on one side, from the outset peaceful police that might do some mistakes on the other side but never have a role that needs to be put into brackets and finally demonstrators with the role to always be peaceful and send signals to those in power. The correct order of the course of events was that no stone causing any harm to the police was thrown at all from the demonstration. What happened was that a police man was hit by a stone after the mass arrest had taken place, without being seriously hurt and at a long distance from were the mass arrest took place and far away from the demonstration. By changing the order of events main stream TV managed to make the massive police arrests more acceptable, a falsification of history in favour of the police that also the Red Green Alliance decided as important to endorse. A main stream right wing organisation could not have done it better. While Red Green Alliance was busy telling the world a story favouring a police perspective built on rumours arrested demonstrators were in deep trouble detained in the Valby special prison for climate protesters. Organisations and friends were worried about their comrades and members. The Socialist Justice party of Sweden belonging to CWI approached Friends of the Earth Sweden to get information on what was going on and what to do. 40 of their party activists from all over the world had been arrested. FoE Sweden decided to initiate a press conference together with as many concerned organisations that could be reached. Within less than half an hour it was possible to find out that any kind of organisation had their members in prison. Nature and Youth Sweden, the youth environmentalist organisation connected to the Conservation Society, Attac, Hare Krishna, Friends of the Earth from at least four countries etc. None had seen any attacks on the police or windows smashed were they had been walking in the demonstration. After a while some of the detained were released and we could meet them. One girl had a more than two inch long and deep broad wound on her wrist. The plastic straps had been put on so hard that first her hands got swollen and then when the police should cut them off they had to cut into her body to get it done. When it was possible for a few Swedish organisations to find out in such a short time about many cases there must be many more. What was now needed was capacity to organize a press conference, a room, international press lists, ability to contact each other from our very different places were we stayed and have sufficient common message and people that had been arrested to make the press conference fruitful. The most relevant organizational actor to ask was the Danish demonstration coordinators. They if anyone had the self interest in protecting their demonstrators. I went to Jörn Andersen, the organiser that had been most visible to international organisations during the whole preparatory process. 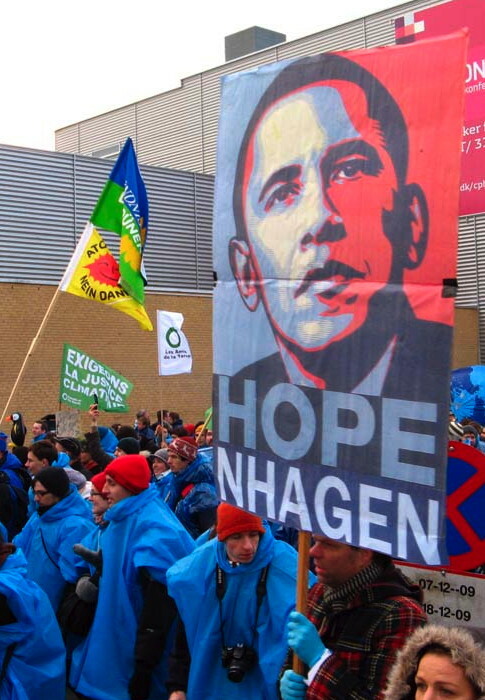 Andersen represented the Climate Movement Denmark but was also a member of the Red Green Alliance. He had a key position as he also belonged to the International Socialist fraction in the party, a fraction linked to Socialist Worker´s Party in the UK who were the key organisers of the Global climate action days both December 2009 but also earlier. He if anyone ought to be able and interested in helping us. But he was the opposite. The first thing he said was in a rejecting voice, did I have some facts. That I had a lot of facts about what had happened to quite a few demonstrators that were in need for solidarity and anti repression work by the demonstration coordinators did not impress upon him. He did not believe that the Danish coordinators would act and coordinate any solidarity work for the detained demonstrators. It was up to us and others to help ourselves the best we could. His party had already chosen without us knowing it and without Andersen informing us to act collectively in immediate support of false facts favouring the police. To make extreme demands on facts supporting the demonstrators was than appropriate to support the version they already had given to the press. So Andersen’s prediction was probably correct. 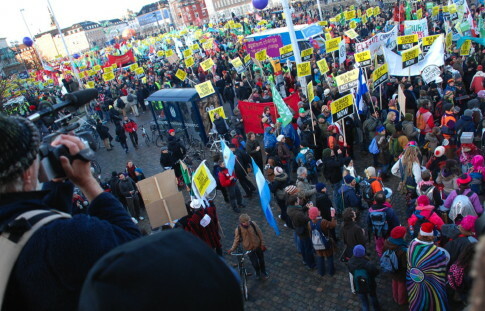 As the most well connected organisation in both Denmark and internationally the Red Green Alliance had chosen what side they were on and what role they claimed the demonstrators had in the immediate reaction. And to his own trotskyist fraction at the core of the whole Global Climate Action Day internationally it was more important in practice to be servile in relationship to the alliance partners than to act in solidarity with the invited demonstrators. After all the demonstrators go home afterwards but the allied main stream left wing parties and NGOs behind the tcktcktck campaign continues to be a force to take into consideration is the thinking behind this kind of reaction. To change such a first position from the Red Green Alliance needed careful attention and then there was not time for any solidarity work for those that had been degradingly treated by the police with the exception of the youth wing who protested at the prison but waited many days until the party had changed their first position to comment upon what had happened. Klimaforum offered help instead, a computer could be borrowed at their office for some minutes, the press room could be used, the press people kindly asked by the press staff to leave a room or stay to listen to the press conference, a cell phones could be recharged at a luxury hotel by a member of a main stream Swedish television crew that were upset about the exaggerated police activity. In some way Danish Attac, Nature and Youth, Friends of the Earth Sweden and Socialist Justice party were able to get our act together precise in time in spite of cell phones lacking sufficient payment for getting on the air, internet connections getting down, email lists missing and arrested people already gone home. Somehow in spite of lack of systematic press contact work the press conference room was more than full when we started. Le Monde, L’Unita, Main stream TV from Denmark and Sweden and a lot of other media were there and the message got out. Meanwhile had the political line by the Red Green Alliance paralysed the whole demonstration committee. It was now time for any Danish organiser of the demonstration to act on their own against the demonstrators and support the police to strengthen their perceived image among the population via mass media. Thus was the first Red Green Alliance press release followed by a statement from the justice affairs spokes person of the Socialist People’s Party, close to midnight when still many were in prison. 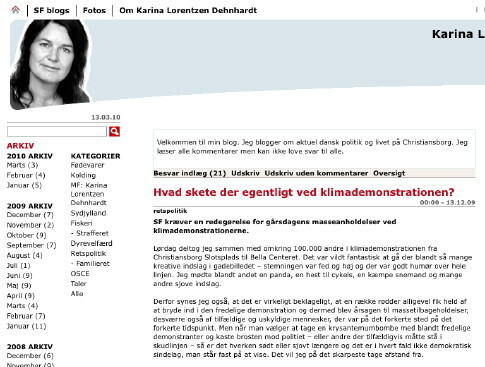 On her party blog under the title What happened at the climate demonstration? Karina Lorentzen presented the same false story as Red Green Alliance, this time with an additional touch to exaggerate the story further. People had chosen to throw cobble stones at the police – or others who may happen to be in firing line. Here we can see the socialist future: If we as organisers of a demonstration do not fully support police intervention we would see how the whole demonstration would need to stop, the whole city being destroyed, anyone being hurt, to not talk about the message to the politicians not delivered. Lorentzen started her statement by describing how ”wildly fantastic” it was to walk with 100,000 other in the demonstration meeting among others a panda, a horse on a bicycle, a giant snowman, and many other funny contributions. Lorentzen than explained why her party had been against the new hooligan law package that gave the police the possibility to intervene as they did. The party warned against preventive arrests and would like to have ensured the possibility that citizens could get a chance to escape and avoid incurring a withdrawal. The immediate response on this blog post was sometimes overwhelmingly positive, but to a growing degree critical. “Your entire second paragraph in your blog post have a problem – primarily because the facts are not okay. We know that the black group would not ’break into the peaceful demonstration’ as you write but that they were pushed into the demonstration by the police as they would go from Højbro Plads, although it was not their intention to go along. Already here all your arguments go wrong and hence your conclusion ”you hide among peaceful demonstrators to perform your misdeeds”. With the two most left wing parliamentary parties decided to act individually and siding with the police the rest of the Danish organisers chose the same method, avoid any collective responsibility and at times make their own isolated statement to the press to wash their hands. Knud Vilby, the spokes person of the demonstration. stated to the press that the police had acted disproportionate. Everything was by now very clear enough to act collectively in defence of the rights of the demonstrators and against the escalation of repression. 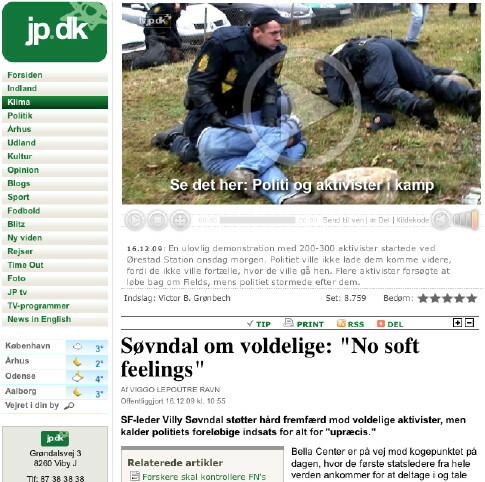 The two main newspapers in Denmark had revealed in their immediate reporting that it was the police that pushed unwilling Never trust a COP activists in black clothes into the main demonstration. These activists had published plans on the internet that they wanted to protests in the city centre and not walk with the march to the South. When this group of activists according to the advice by the police came to the demonstration some windows at the stock exchange, one at the foreign ministry and one at a bank were smashed along the demonstration route. 1 km from the stock exchange and more than 0,5 km from the bank more than 900 people were arrested and detained in a specially prepared prison half an hour after troubles started. Jyllandsposten, the biggest pro-governmental Danish daily reported that ”It was an apparently well-prepared and rehearsed policing plan, which resulted in one of Denmark’s largest mass arrests”. After the mass arrest almost 1 km away at Christiania were four cars burnt and a policemen was hit by a cobble stone without being seriously hurt. 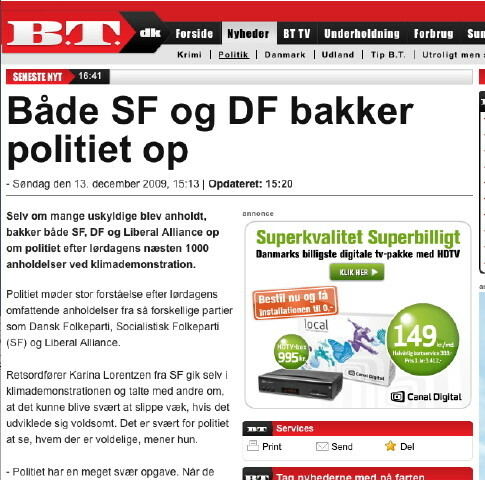 In spite of that it was clear that the Danish state had made a massive attack on democratic rights and the police according to the pro-government daily apparently organized an ambush against the demonstration the organisers chose to act individually as persons or organisations. The strong wording among the organisers were still directed against the non existent people in the demonstrations that had thrown cobble stones hurting a policeman, not to protect their own demonstrators. 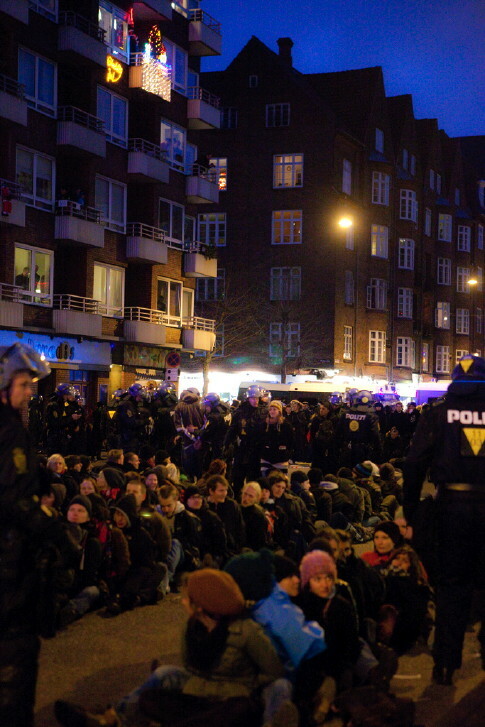 The numerous witnesses about the abuses during the mass arrests made it soon necessary to shift tactics among the Danish organisers of the demonstration. This was done in an odd way. If the first statements had been the result of the risk of not having the full picture the day after this was not the case anymore. Instead of reacting collectively against the politics of the Danish state to organize mass escalation of degrading treatment of demonstrators individualistic competition in promoting diverse policy proposals via mass media started. The extreme support by the most left wing parliamentary parties on Saturday of a police version making repression in a scale not seen in many countries against a demonstration understandable, had to be replaced by something else. And why not with a quarrel among all left wing parties on different policy proposals. Here each party could raise its profile making some discrete retreats from the mistakes the first day in a clever cover up operation in close relationship with the media. Why should the reporters ask troublesome questions to the parties that organised the demonstration why they not together with others in the Danish 12 December Initiative collectively defended their demonstrators. It was so much more politically uninteresting to promote a politically powerless quarrel on policy details between individualistically acting parties. 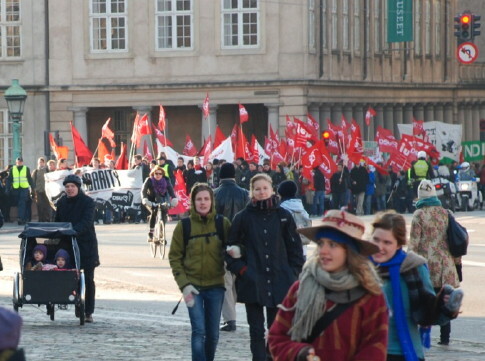 Popular movements and an interested public in many countries all over the world would really have been interested in why the Danish organisations that had invited 100 000 demonstrators to come to Copenhagen did not want to collectively defend them. 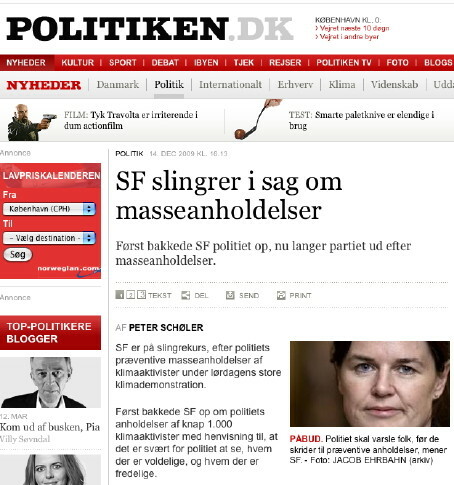 That was the politically interesting question that the Danish media and the Danish organizations in unity avoided. 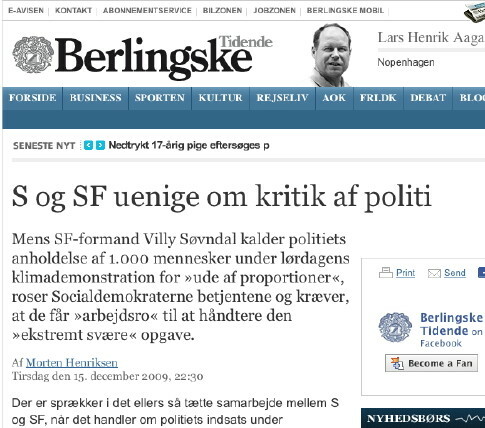 Troublesome for the Socialist People’s Party was a growing negative reaction at both the blog of the spokes person of justice affairs and the facebook group of the party leader Villy Søvndal. Hundreds of people reacted often very strongly against the position of the party and many questioned their membership. Later on Sunday Lorentzen issued a press release in which she expressed that it is wrong to arrest people before they have committed any wrongdoing. “When the hooligan package was adopted, we very much pointed at that preventive arrests are problematic because it is an interference before people have committed a crime. This means of course that you might get some in the net who have not intended to start a turmoil”. The original version mainly condemning people using the demonstration for throwing stones at the police had changed and the focus was now on fire in the streets and that it ”appeared” as if the police had stopped people from using their right to express themselves. For some reason the party shows special interest only in one group were they ask for extra attention in the investigation they want to be conducted, the press. When it seemed as a slight difference between the position of the Red Green Alliance and the Socialist People’s Party emerged Clausen was not late in using it. In the press he stated that the competing left wing party was embarrassing as it did not take a clear distance from unreasonable police preventive arrests of people who have done nothing illegal. It is important both to distance oneself from violence and vandalism and the police state, he concluded. “Broad political support for the police”. 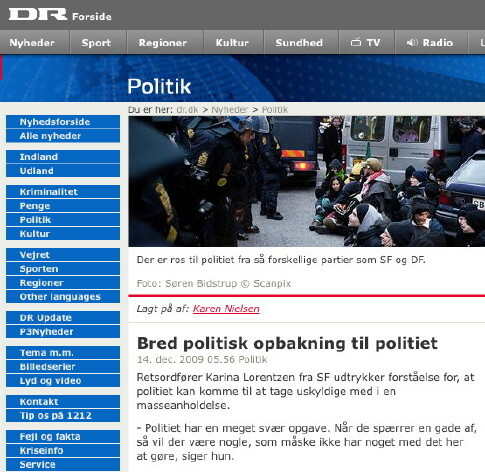 DR, (Danish public service media). So what many left wingers would describe as a bourgeoisie party made the opposite to the left wing parties in three ways. Firstly attacking the government and not the police or other oppositional parties to the left. Secondly focusing on that it is wrong to detain innocent people. Thirdly using emotional wording as violently not from a police perspective but rather from a democratic giving emphasis on the concern the party had from the beginning and now even more had against the law and its consequences. This made it obvious that it was possible to mobilise a broad alliance far beyond the left wing political culture to defend the democratic rights against the new mass arrest practice. The problem was not that it was impossible in Denmark to formulate the basis for collectively denouncing the attack on the integrity of the 12 December initiative mass protest. The problem was that both the left wing parties and the Danish organizing committee were unwilling to mobilise any collective response but preferred individualistic and disperse reactions. During Sunday almost a whole demonstration was mass arrested on the way to the harbour were a non-violent action had been announced. ”I would also like to stress that it was undoubtedly necessary for the police to act against those who threw the firecracker and cobbles in the middle of an otherwise fantastic and peaceful demonstration. This behaviour is in no way an expression of democratic sentiment. We have also previously seen some cities being totally devastated by the violent protesters: Berlin, Seattle and many more. Copenhagen should not be in this row. It was now necessary for the popular party leader Villy Søvndal to intervene. Two hours after the spokes person made her third statement after the demonstration with shifting focus and different content he wrote on his facebook page under the heading: Nice demonstration – unfortunately too many arrests. This was news. Before the Socialist People’s Party had voted against the new law package proposed by the government but not promised that if they came to power they would abolish the law, as the Social democrats. Contrary to the social liberal party and the Red Green Alliance they voted against the law package not on principle but to gain some attention while maintaining a wait and see position. Now the party leader had decided that it was the time to declare a more stead fast opposition while the emotional rhetoric still was much in support of the police and mainly directed against activist accused of intending to use the demonstration for street fighting. During the day the No border demonstration to protect the rights of climate and other refugees went along without problem. 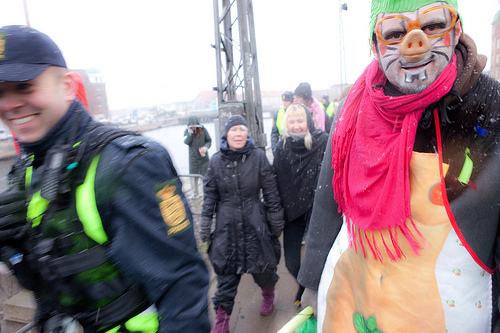 In the night the police intervened at Christiania were Climate Justice Action had a debate followed by a party. 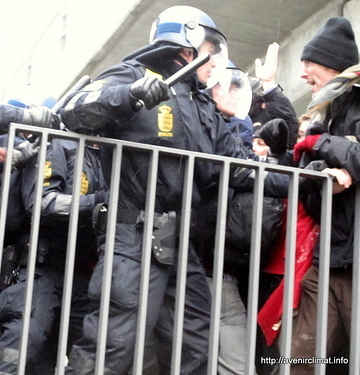 The police stormed into Christiania throwing tear gas and arrested people meeting some resistance. 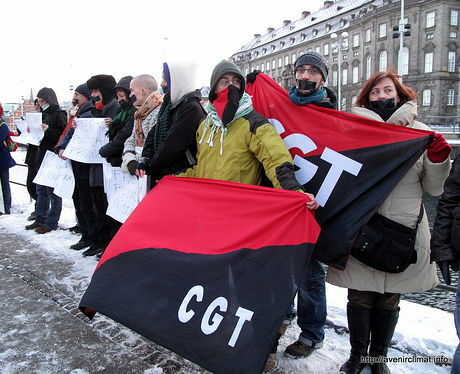 Social democratic youth bloc in the 12 december demonstration. Tuesday was the time for the third left wing party to intervene, the Social Democrats. They did not see any reason to make much of public statements in the press before this as their positions on policing is very close to that of the Socialist People’s Party. But now their cooperation partner had gone too far. “We have confidence that the police acted properly. There is not something I would criticize the police for, ” says Henrik Sass Larsen. Also justice affairs spokesperson Karen Haekkerup distance herself to Søvndal’s criticism. The pecking order among the left wing parties all speaking at the demonstration was established. The one with the most privileged speaking slot at the best place and time for media attention at the demonstration, the Social democrats, most strongly and consistently in favour of the police attack on the demonstration. The two other left wing parties with less privileged speaking slots, in the beginning in favour of a police perspective making the police attack on the demonstration understandable and then in different degrees opposing the mass arrest and partly the police perspective. All avoiding initiating a collective response from the Danish organisers on the repressive politics carried out by the Danish state against climate protesters in Copenhagen. This new pecking order made it possible for the Red Green Alliance to more and more take the side of the climate protesters. The most interesting thing with this day is how it is now revealed the way a left wing party and maybe all of them think strategically. One reason why the social democrats do not defend the demonstrators in the manifestation they themselves are collectively responsible for as organisers and among the privileged speakers is explicitly stated. It is not the way the police act against the demonstrators which is the main interest for this party, but the situation the police have when in general they ”must provide security to the climate summit”. A task presented not as related to the demonstration in the past but as a task in the present as the protests at Bella Center are not over. On Tuesday also the escalation of extreme repression of a new kind not seen for a hundred years under normal circumstances in Europe was put into practice. Police arrested the spokesman of the Climate Justice Action, Tadzio Müller, after he had held a press conference at the Bella Center with several NGOs and organizations. This kind of targeted arrests was once common in attempting at stopping popular movements. But the experience showed in the long run that it was counter productive. By conflating the role of spokes person for a non-violent action with the possibility that someone in the non-violent action other than the spokes person might harm a policemen the state could put many people in prison. At the same time this was practical in short term as the opinion of the movement got stiffed or silenced and was an effective way to criminalize freedom of expression. But as the underlying causes still existed this caused even more unrest as well as undermined the whole rule of law with its principles of individual responsibility. Thus this extremely repressive politics had to be reconsidered. Denmark reintroduced this state repression of freedom of expression a hundred years after it was seen as an unacceptable act against freedom and counterproductive way to postpone the solution of social conflicts escalating unrest instead of promoting political solutions. This is remarkable. How can a nation become so democratically backward that such state acts against freedom of expression reemerge without any collective response? The Red Green Alliance issued a press release with a protest. That was about all. Line Barfod, the spokes person on justice affairs of the party stated: Arrest of spokesperson is an error. ”- It is quite wrong to arrest the spokesperson from an avowedly non-violent organization. Were are we heading, if we begin to arrest the spokespersons from legal and non-violent political groups. – Police should instead maintain dialogue with non-violent activists to ensure that their protest tomorrow will take place without violence from either activists or police, as also the activists want. It is totally unacceptable that NGOs are largely expelled from the Bella Center on Friday, when it expects to publish the outcome of the climate summit. The consequence is that critical voices will be gone and the world’s politicians will have the stage to himself and have the ability to sell a bad result as a success, says Per Clausen, climate spokes person for the red Green Alliance. Environmental and global justice organisations made a last attempt at confronting the growing repression. Friends of the Earth Sweden, Climate Movement Denmark and Attac Denmark initiated a debate at Klimaforum with representatives from all continents in the South inviting all Danish parliamentary parties to come and listen to the views of international guests and give their opinion on repression during the COP15. Red Green Alliance turned up and the social liberal party would have liked to come but had problems on such a short notice. No other party was interested. The initiative to challenge Danish organisations to contribute to collective efforts against the repression ended in the same way as earlier, by individual statements and no commitment to act or even try to act collectively neither from a party or other formal Danish organisations. The protest action on agriculture organised by CJA, Via Campesina, Friend of the Earth, A SEED and others went well. This was the day of the Reclaim power action. 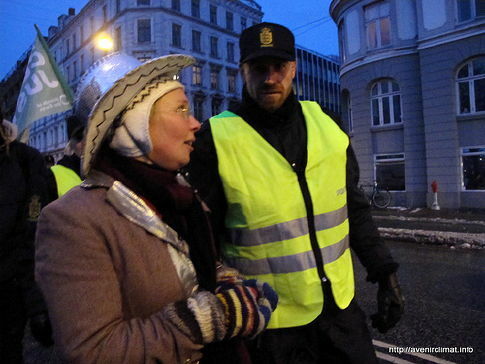 Targeted arrests continued against two spokes persons Nicolas Haeringer and Tannie Nybøe of CJA before the call for making the push at Bella center against the police lines were made to establish a People’s Assembly together with people coming from the inside. Mass arrests of almost a whole so called Green bloc took place at Örestad and the bike bloc also had great difficulties. 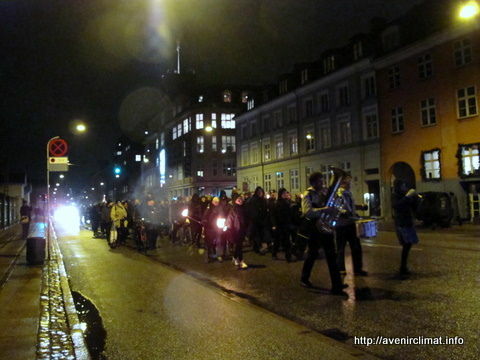 But thousands marched in the main blue bloc steadfast towards Bella center. Soon a historically new step in the repression against popular movements takes place nearby were the Socialist party leader was interviewed. The Danish police starts to violently bank UN accredited delegates from movements that are participating in the Reclaim Power action from the inside to stop them from reaching those coming from the outside. It is the first time to my knowledge that officially UN accredited participants are beaten by police of the host country when they try to leave the official conference venue. A People’s Assembly is finally successfully established by those on the outside surrounded almost completely by police and finally a march together to the city centre in good mood ends the mass action. In total 260 people are arrested and detained in the special climate prison in Valby during the day, some 30 pepper sprayed and 10 wounded among the activists. No reports of any harm to policemen or anything else is reported. ”The 12th of December 2009 will be remembered as the day when the rule of law and its basic principles had to give way for each individual policemen arbitrary assessment of how extensively the ’law and order’ were respected. This was the day where up to 700 demonstrators during the climate summit were arrested and taken to the temporary COP15 prison cells where the detainees had to adapt to many hours of waiting behind bars in appalling conditions. Some of the demonstrators were certainly arrested on a valid basis – it is totally unacceptable to throw paving stones and attacking police to get a political message across. But there was also an unnecessarily high number of innocent people among those arrested as the hooligan package allows the police to make the so-called preventative arrests. It has thus become legal to detain a person for up to 12 hours, only if the police deem that he possibly could jeopardize safety. Man is no longer innocent until proven otherwise, however, you are guilty even before you have done anything criminal. It is very problematic that the police have increased powers to make far-reaching interventions in the individual’s personal freedom. Detention, as an administrative arrest of course is, requires considerable control and security. An arbitrary discretion from a tired cop is not enough if the rule of law should apply. – I could not agree more – super article! – It is elegantly written! Unfortunately it seems that the popular mood is happy about the actions, although every third are genuine opponents to the package. – Frederick: I have heard it and it can be only explained by the fact that some want to give up freedom for security .. It is incomprehensible to us liberals. The continued comments differed from what happened to the Socialist People’s Party blog posts. The discussion was clearly focused on facts and principles rather than the populistic tone of both the socialist party spokes persons and many of their commentators in opposing directions although of course also here existed discussions to the point. With the statements from the social liberal party and now the more right wing liberal youth it became even more hard to understand why the left wing parties had chosen a far less coherent and at times police perspective in the way of responding to the repression. The party leader Søvndal announces that he will eat breakfast with the Socialist president Evo Morales from Bolivia on his facebook blog. Søvndal especially emphasises that Morales is a winner, someone that is clearly victorious against the right wing in the recent elections. He very much looks forward to meet this winner. The Red Green Alliance politics now more firm in the hands of the spokes person Barfod for justice affairs do not either take part in collective action but makes something out of a response from the Conservative minister of justice on the hooligan law package. The minister had responded to earlier critical questions from Barfod that ”Of course, detainees protestors would be allowed to go to the bathroom and get something to drink”. Relatives were also assured that they should be informed about the detention. ”It is in sharp contrast to the situation during the great peaceful demonstration on 12th of December, when 968 were detained.” Barfod stated in a press release. Others are more involved in collective organizing of protests against repression including the imprisoned Climate Justice Action spokes persons and the heavy crack down on both the inside and outside Reclaim power action, issues that Evo Morales addressed as speaker at the UN Conference but something Søvndal stays out of doing something about. In front of Christiansborg a fast organized vigil with protesters stating free the political prisoners and takes place in the afternoon. The action is small, the media interest big. At Klimaforum a seminar on popular movement cooperation against repression started. 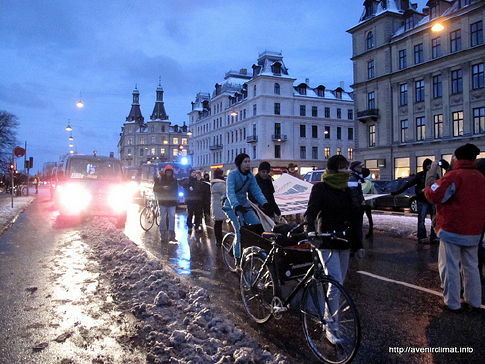 It was organized by Friends of the Earth Sweden, Climate Collective and others. A problem was that the Climate Collective preparing the seminar all were in prison. At Valby hall not far from the climate prison thousands of people gathered to hear the Venezuelan president Hugo Chavez and Morales speak. They mainly addressed climate issues and the need for socialism but also strongly protested against the police repression in Copenhagen. The Danish left wing organisers continued to avoid any collective response to the repression and support the demonstrators as well as the opinion of Morales and Chavez. The biggest indoor mass meeting during the whole climate summit perfectly placed for making a call for action against the repression of the climate justice movement was not used for this at all. 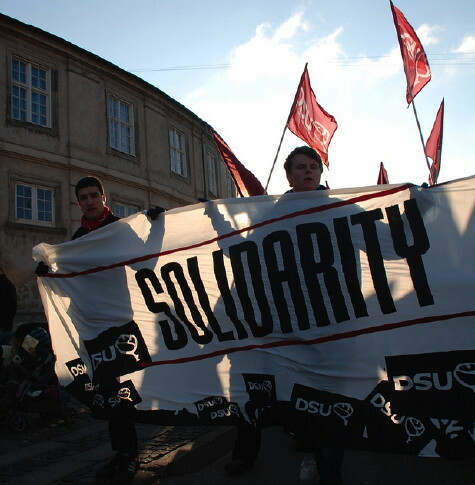 The Danish left did see no need in supporting international solidarity in spite of that they had all the chances. Climate Justice Action and Climate Justice Now! organized a demonstration supported by all the present international popular movements against the repression, the mass arrests and with the demand to release the climate prisoners. 1,500 people participated. The Danish formal organisations were still as passive as ever continuing to avoid collective responsibility for protecting the rights of those that had marched on their invitation in Copenhagen.